It's that time again, North America, for the latest Nintendo Download Update details, and this week is varied and a tad bizarre. 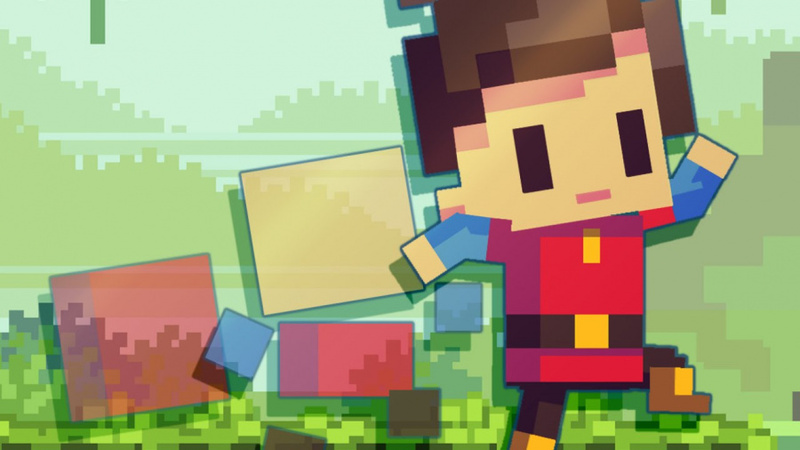 We have an eagerly anticipated eShop platformer, a world-building title aiming to bring a bit of Minecraft-style glamour to the home console, while the 3DS has a tough platformer and a hefty RPG. There are some diverse other offerings on Wii U and - wait for it - SIX DSiWare games. SIX! Scan your eyeballs down for the details. Missed the European Download Update details earlier in the week? That was silly! Well don't worry, the details are right here. Adventures of Pip (Tic Toc Games, $14.99) - This stylish platformer has been on some wishlists for quite some time, hearkening back to a retro age with pixel-based visuals and utilising a clever mechanic of powering up between generations of visual styles. Though it can occasionally fall flat in some secondary areas, it's nevertheless an accomplished, enjoyable experience - we gave it a solid recommendation in our Adventures of Pip review. 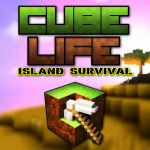 Cube Life: Island Survival (Cypronia, $6.99) - This is a block-building survival game, so is naturally inspired by the Minecraft phenomenon. The Survival mode looks set to feature the exploration, forging and survival aspects familiar in the genre, while Creative mode lets you generate structures that can be shared on Miiverse. We'll see whether this is a notch above or below the competition in our review. 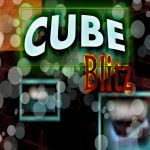 Cube Blitz (Wildcard Studios, $3.99) - This is a GamePad-focused game which, based on the visuals, seems to be a Nintendo Web Framework release. The focus seems to be touch based, as you tap blocks (or use a limited number of bombs) to clear them and free gems for the end area. We'll tap away at a review. The Stonecutter (Brave Rock Games, $1.20) - This appears to be an interactive children's story, telling an ancient Chinese morality tale about granting wishes; we'll make our choices and bring you a review. Pac-Attack (Bandai Namco, $7.99) - The pellet-eating mascot was a big deal in decades gone by, so it's no surprise that the IP was utilised for a Tetris-style puzzle experience. This entry does shake things up by employing ghosts and other Pac-Man ideas, and this SNES version also has two-player options. We gave this a decent recommendation in our Pac-Attack review. 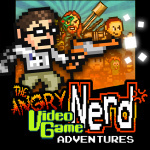 Angry Video Game Nerd Adventures (ScrewAttack Games, $9.99) - Having already arrived on the Wii U eShop, we now have the portable version of that rather difficult platformer that pays homage to the YouTube celebrity. This version throws stereoscopic 3D into the mix, and if you like a challenge it may be well worth consideration. We'll put this 3DS entry through its paces, but in the meantime you can see our recommendation in our Wii U eShop Angry Video Game Nerd Adventures review. Lord of Magna: Maiden Heaven (Marvelous, $39.99) - This retail title is localised for Europe as an eShop-only release and is produced by Yoshifumi Hashimoto, the man behind Harvest Moon, Rune Factory and Story of Seasons. An RPG with battles that focus on areas rather than grids, this also promises a diverse cast and dramatic storyline. We'll let you know what we think in a review. G.G Series THE SPIKY BLOWFISH!! (Genterprise, 200 Nintendo Points) - In this title you navigate a blowfish through stages before coming across a range of bosses; we'll dive to the depths for a review. G.G Series HERO PUZZLE (Genterprise, 200 Nintendo Points) - Perhaps taking a cue from GungHo, this appears to blend RPG elements with match-three gameplay; we'll puzzle it out for a review. G.G Series EXCITING RIVER (Genterprise, 200 Nintendo Points) - We seems to have a simple arcade-like experience, in which you control oars with L and R to guide a boat down a treacherous river; we'll try not to sink in our review. G.G Series COSMO RALLY (Genterprise, 200 Nintendo Points) - A top-down racer in which you represent Earth in high-speed contests - no, it doesn't look much like F-Zero. G.G Series ALTERED WEAPON (Genterprise, 200 Nintendo Points) - This one's caught our eye a little more successfully that some of its current DSiWare contemporaries, as it appears to be a sidescrolling platformer in which you morph between being a robot and a car, each with powerful guns. We'll transform ourselves for a review. G.G Series ASSAULT BUSTER (Genterprise, 200 Nintendo Points) - The final DSiWare arrival of the week, this is a wave-based shmup; there doesn't seem to be much more to say. More Teyon and EnjoyUp Games discounts will be detailed at 9am Pacific / noon Eastern on the official eShop offers website. That's everything on the way to the North American eShop stores this week. Let us know what you plan to download in the poll and comments below. I might be too busy leveling up in Splatoon this weekend, but it's cool AVGN Adventures is on 3DS. Will be redeeming my Pip kickstarter code shortly. Better week for the 3DS than the last several. Still pretty bad though. Picking up AVGN on 3DS. Bird Mania 3D permanently reduced to .99 cents!! I shall now redownload that onto my old black cosmo 3DS. Pac Attack is good, but I've already got it in my Pac Man collection. Not worth another 8 bucks for two players I don't think anyway. Seems odd they want to release 2 versions of the same game on the eShop when there are plenty of other games that need to be put on the shop. I think I'm going to get the AVGN game. Nothing for me. I have Splatoon and a Wii U Pro Controller so I can play HW without worrying about battery life. Definitely getting Adventures of Pip. After trying it at a PAX event, I wished I helped with the Kickstarter. I hope more N64, GBA, or DS Virtual Console comes to the shop soon. I saw Lord of Magna: Maiden Heaven at GameStop yesterday and was wondering what it was. It was the first time I had ever seen or heard of it. I'm not wasting $7.99 on a SNES game that's already included in Pac-Man Collection for the gba in which I have. Let me know when Mario & Luigi: Partners in Time along with Metroid: Zero Mission arrive on the eShop. Um..isn't DSiWare inaccessable now due to Nintendo pulling the plug on DS servers? Also Adventures of Pip looks fun. Might be downloading that. I really wish Nintendo would embrace cross-buy like Sony (or maybe it's the developers; I'm honestly not sure who would make that call, so I guess I shouldn't point fingers). Anyone know what Witch & Hero's discounted price is? It gets harder and harder to defend you when you do stupid stuff like this! I only have a 3DS and I'm starting to feel like I did when the Aqua Blue first came out! Na, like with the Wii's online connection, online play has been disabled, but you can still access the shop. I would pick up Unepic but I just got all the games with the Humble Bundle and Splatoon last week so I will be holding off. I will be downloading the new MH4U content tomorrow though!!!! As a big fan of Yoshifumi Hashimoto's works, Lord of Magna looks like something I want to get eventually. Everything else 3DS/DSi seems okay, just not my cup of tea. I'll add my obligatory "where's zero mission?" comment. I want lord of magna but I am broke after buying 2 new pairs of glasses, splatoon and amiibo. Lord of Magna is good; I got it yesterday and it is a unique cross between the Tales games, Harvest Moon and Rune Factory. e3 is also right around the corner so I'm sure surprises are in store for the quick days to come for all those who are flustered by this week's lack of Mario, Link, and Samus. We cry for something old when we get something new; we whine for something new when they give something old. Fans: hard to please since all the time. @No-longer-postin You know Nintendo doesn't make the G.G. Series games, right? Do you also get mad at Nintendo when people make new NES games? God, what the heck, Atari?? Why are you STILL supporting the Atari 2600 with a port of Halo??? The system is almost 40 years old! Where is Golden Sun 2? Looks like a huge week but it really isn't. The 3DS RPG might be a good one but I'm still refusing to download retail titles at full price. Hello! No box, no instructions, no manufacturers cost= a download discount. When will there ever be a savings for downloading retail games? Simply ridiculous! Common man! @Zach777 The e-shope is incredibly lame compared to the stores on xbl or PSN. I believe that is why many complain. There is less sales on Nintendo's service. There is less options on nintendo's service. With my 360&ps3, I've got a decent collection of arcade and Dreamcast games. The Wii u looks like it will only receive roms from Nintemdo system's. NOA pick's some of the worst games ( mighty bomb jack) ,and ignore fan's requests for games like DKC or Metriod. That shows me the folks over at NOA are probably more business men than someone who is a actual gamer with a degree. The drip feed of content has also gotten old. I've been dealing with it since the e-shope was up and running. Nintendo has a massive amount of improvement to do on their e-shope service. Unless Nintendo puts GBA and DS games on the 3DS, the 3DS VC won't be getting any more games for it. @Yellowkoopa Thanks for reminding me! Nintendo completely stopped supporting 3ds virtual console! Wow, huge bulk of DSiWare games. @Zach777 I really want this game since it looks a lot like Rune Factory. what is the battle system like for this game? Is there a marriage scenario as well? @Superryanworld No problem, and Nintendo could have a good selection of games on the 3DS and Wii U VC along with cross buy, but this is Nintendo, that type of things doesn't exist to them. I'll get cube life if it gets released in Canada. It's good to finally see another SNES game on VC, but I'm still waiting for more N64 games. @Superryanworld I wouldn't be surprised if they just completely drop the VC next gen.
@Superryanworld Call up some third parties and ask them to add their consoles to the virtual console. The lack of support from third parties is not just hurting the retail market, but also the virtual console. Nothing at the moment, but I'll be sure to get Lord of Magna physical later. Will probably get it together with Stella Glow later when I can since they're both FINAL JRPGs of two JRPG companies. For now I have my hands full and wallet empty with my lovely little Vita with Neptunia Re;Birth3 coming this month and Ar no Surge Plus coming next month along with other JRPGs. @Superryanworld Also compare the DSi shop/Wii shop to the eShop on 3DS and Wii U.It is night and day compared to what they had previously. The reason for the drip feed of virtual console games is because they are running out of games they can release.Nintendo has allready almost used up all of their first party titles on Nes and Snes.Why no cross buy? Old licensing deals preculde that option for the virtual console. @Superryanworld Uhhhh...theres sales constantly on the eshop so I'm not sure what you're talking about there. On top of that, you seem to be acting like Sony listens to fan requests for digital PS1 and PS2 games, but its really just the same situation. Usually 1 or 2 PS1 or PS2 games will come out. Sometimes it'll be something people waited for or maybe it won't. It happens. And more often than not theres not even a release that week at all, so at least VC updates more frequently. VC games will come out when they come out. Just because we don't get Zero Mission or Sacred Stones doesn't mean the people at Nintendo are rubbing their hands together and going "Lets put up a game nobody was asking for! That'll show them!" I've been saying this since the Wii days but theres probably at least one person out there happy with whatever games that come out that week. @Yellowkoopa It looks like Nintendo is also almost out of first party releases for the Game Boy/Game Boy Color for the 3DS virtual console too. The third party situation is also hurting the virtual console. Wii U on GBA does not look too well ether.I guess that is why they added DS and Wii to the Wii U virtual console. I might get Urban Trials Freestyle. @NandN3ds The problem isn't the lack of GBA games, rather that NoA's choices are bad. NoE released Fire Emblem Sacred Stones, Metroid Zero Mission, Golden Sun 2, etc. which are fantastic GBA games but NoA is delaying them for several months for whatever reason. I see. That explains a few of my issues. I'm greatful that Capcom,Sega, and Namco have helped the VC service, but it would seem Nintendo is going to have to try harder to win back third party support. Wii&DS vc really spoiled us. I guess that's why WiiU&3ds vc has been a underwhelming service in comparison. The one thing I really want to get a better understanding on is the NOJ vs everywhere else situation. I would be nice to get Sonic Advance or anything Square Enix on the service. Not to mention the other games that have yet to release in NA or EU. @Grumblevolcano To fill out the empty virtual console release schedule?Would you rather have games over a period of time or all the games that they have at once and none afterwards.Nintendo only has so many first party games they can release and after that there are none.That is probably why they added the DS and Wii to the lineup.Nintendo does it all the time with the 3DS and Wii U.Delay finished games and release them later to fill the schedule. Another bland week, nothing for me AGAIN. @Grumblevolcano Currently, Ive been pretty unhappy with NOA. The way they've handled the repair of my N3ds has been totally unacceptable. It's been in and out of repair since late FEB. The way NOA handles VC is just another reason why i'd like to see some management changes within the company. @Yellowkoopa I doubt that, they have a big catalog and will want to capitalize on it. They do need to seriously step it up though as their offerings are anemic at this point. @Tazcat2011 Nintendo only has so many first party games to release and after that there is basically nothing because most third parties are not interested. @NandN3ds they haven't even released all first party games yet either. @KnightRider666 See my post about the limited first party releases on the virtual console. That is one reason that the 3DS virtual console is basically dead. @WarioFan63 You make a fair point. I forget the 360&ps3 are nearly ten years old. It's sad the Wii U isn't going to last even five years, so it's looking like VC won't reach it's true potential until NX arrives. @Tazcat2011 Repost: To fill out the empty virtual console release schedule?Would you rather have games over a period of time or all the games that they have at once and none afterwards.Nintendo only has so many first party games they can release and after that there are none.That is probably why they added the DS and Wii to the lineup.Nintendo does it all the time with the 3DS and Wii U.Delay finished games and release them later to fill the schedule. Hmm... Maybe Lord of Magna, but probably get the physical release. Will see the review first though. Stop wasting the Virtual Console Nintendo. Bring Back Three Tittles a week. So excited for Pip, tried to redeem my Kickstarter eshop key last night, but of course it wasn't available yet, even with the key...so tonight! @NandN3ds The back catalog of 1st party games should be available now in its entirety. I'm sure this won't happen because of the economics of doing so. The biggest frustration is how some regions have certain VC games while other regions don't; there's no consistency. @Tazcat2011 You hit the nail on the head there. I know I've just spended money on the humble bundle but I'm saving money on puzzle s and dragons. Heh, knowing gg they can come out with great games. No Neo Geo or Commodore por Wii U eshop? no unify the Wii/Wii U eshops? I´m just dreaming to see something similar like the excellent 3DS eshop with all DSiware catalog inside. Holy crap that's a lot of DSiWare out of no where. Huh. You all need to stop being so negative. G.G. Series has made some really fun budget titles before, so one or two of these need to be fun. I'm definitely excited to check some out them out. Wow... This week. Thats ok. I have plenty and need to save money anyway. Wake me when we get some more Wii games or something killer like Zero Mission. Found Pandora's Tower used and complete at Gamestop last week... If they put it on the eShop for North America then the devs would've got that money. I got tired of waiting, and I guess I'll settle for the disc for now. And so Natsume yet another snes game appears on vc!! That's 4 since you stated a month ago that Nintendo was moving on! SO POCKY N ROCKY 1&2 PLEASE?? I love AVGN but I'm a little hesitant to spend my last $10 in the eshop on this game. just bought cube life and it's cheap for the time being so if anyone wants it better buy it before its price is raised which i think it will be $15 usd after about a week, don't quote me on that. @NandN3ds They have enough games unreleased on Wii U VC that they could easily have at least 2 very good games per week for the rest of the Wii U's lifespan. Instead they decide to clump games together and release like 4-6 great games in a week that's part of a retail game drought and then back to the junk releases like Donkey Kong Jr. Math. I'm just waiting for Lucas. So, is the 3DS VC DOA? @Superryanworld I have been there before. I had to send my launch 3DS in for repair when it started going to an error screen everytime I loaded up on app or game and after sending it in three times with written letters sent along with it they finally just restored the system to the factory default settings. I lost all my activity log data which still stings a bit but in the end it fixed my problem. Hopefully they actually fix your problem because I know what it is like sending in your 3DS for months without a successful repair, you have to be absolutely clear as to what the problem is. Thanks for the kind words. I've been having the exact same issue that you described. It's nice to know I'm not the only one who experienced this problem. At least i know how my situation will be resolved. @dkxcalibur @daveh30 Unepic was a gem of an action adventure RPG for me. Tons of rooms to explore, customizable weapon load outs, crazy funny side quests, & unique bosses. Take the plunge it'll be epic. Having a blast with Adventures of Pip right now, happy to have helped this KS success make it to Wii U. @ThomasBW84 Did you make that "Notch" pun on purpose?! GENIUS. Might be getting the AVGN game for the 3DS...but the Humble Nindie Bundle may have just created a heck of a backlog for me. @sinalefa it's nice to here so many people still playing HW latently. @Zach777 Oh, it's actually good? Well, looks like I'll stop trying to find a copy of Rune Factory IV, then. It feels as if there are a lot of GBA JRPGs that are overlooked. I want them to come back to us, even as a sort of VC release. wow, whats with the 3DS virtual console drought? I already own the Pac-Man Collection which cost less than Pac-Attack. Go DSiware will never die but 3DS VC died years ago. That's incredibly insulting. How about actually putting games people WANT on sale??? Also, it's absurd there are not SNES or GBA games on the 3DS VC. Bought the Humble Nindie Bundle, it should have been on the list. Why pay for 1 game when you can pay $10 for 11? I had a dedicated shovel back in the day for DSiware. Time to go find it and dust it off! Don't get me wrong, there were a few fantastic titles.